Figure 1. The site of Douzlakh, view from south (photograph: Deutsches Bergbau-Museum). The sensational finds of mummified remains of ancient miners in the opencast salt mine of Douzlakh (Figure 1) have been attracting scientific and scholarly interest since their discovery in 1994 (RCCCR 1998; Aali 2005; Shokouhi 2005; Vatandoust & Hadian-Dehkordi 2005). In the following years rescue excavations have been conducted by the Zanjan branch of the Miras Farhangi (Zanjan Cultural Heritage, Handicrafts and Tourism Organisation) and in 2008 an initial conference was held in Zanjan. This resulted in the setting up of an international, multidisciplinary research project whose main partners are Abolfazl Aali (Miras Farhangi Zanjan), Mark Pollard (University of Oxford), Frank Rühli (Universität Zürich) and Thomas Stöllner (Deutsches Bergbau-Museum & Ruhr Universität Bochum). The project comprises scholars and scientists from Iran, France, Germany, Great Britain and Switzerland. Figure 2. Map of Iran, showing the location of the salt mine. 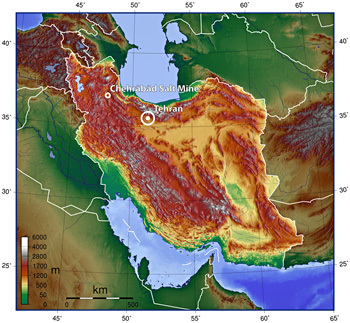 Source: http://en.wikipedia.org/wiki/File:Iran_topo_en.jpg, originally uploaded by Captain Blood). The Chehrabad salt mine is located in north-western Iran, 75km north-west of the city of Zanjan, close to the villages of Hamzeli and Chehrabad (Figure 2). The area belongs to the Ghezel Ozan basin, and consists of a range-like series of hills between two narrow valleys, running from north-west to south-east. 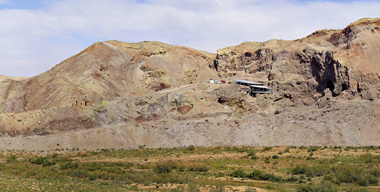 The mine is located on one of the slopes at around 1350m asl. The interpretation of the various features and structures (Figure 3) combined with recent results of 14C analyses has led to a better understanding of the different phases of extraction and abandonment of the area investigated (Aali et al. 2012). 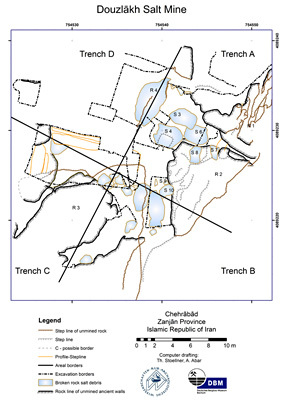 The excavation seasons of 2010 and 2011 have produced data indicating that mining activities took place over a long time span, with the first period of mining dated to the fifth century BC (Achaemenid period). The end of this phase is marked by several cave-ins, which caused the deaths of a number of miners. This catastrophe most probably occurred around 400 BC, based on the dating of three mummified bodies (nos. 3–5) (Pollard et al. 2008). Reuse is dated to the fifth century AD (Sassanian period), from straw and dung layers found on top of layers of rock fall and erosion deposits. Figure 3. Detailed map of the site (graphics: Deutsches Bergbau-Museum). Figure 4. 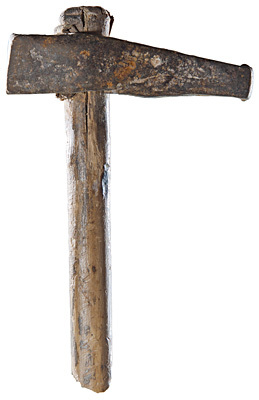 Iron pick with wooden handle, length c. 210mm, Archaeological Museum Zanjan (photograph: Deutsches Bergbau-Museum). Examination of the extraction techniques through the study of tools (Figure 4) and the well-preserved mining traces show that the miners extracted salt by pillar-and-chamber mining, using metal picks and adzes. Timbering techniques seem not to have been used. It is highly likely that modes of production differed through the periods represented, perhaps in relation to trade and social conventions.